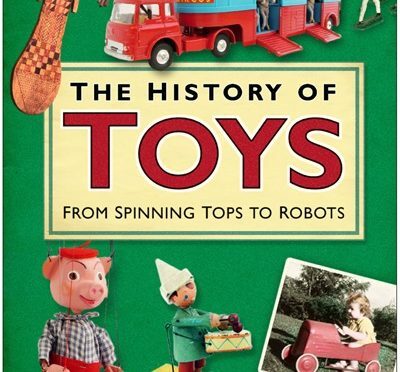 This book traces the history of toys from the Stone Age to the present. 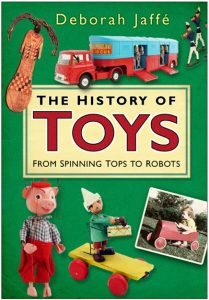 The History of Toys explores the various influences on toys from politics and marketing to religion and education. It reflects changing attitudes to childhood as well as the influences of technology and the invention of new materials on the imagery of toys as well as in their design and production. Remarkably, some toys have changed very little despite a change in materials: rattles once made of straw, clay, silver, leather and wood are now made of plastic. Greek, Egyptian and Roman children played with dolls, miniature houses, balls, spinning tops and pull-along animals on wheels. Kites have been flown in China for centuries. Dolls have been made from wood, fabric, leather or porcelain all of which have now been replaced by plastics. From medieval times the toy making industry has focussed on Nuremberg in Germany, which is an excellent example of how highly organised but small scale, craft based production can develop into a huge, highly mechanised manufacturing base. Specialist toy designers and manufacturers like Ernst Paul Lehmann, the Bing Brothers, Mme Montanari, Kathë Kruse, Sasha Morgenthaler, Frank Hornby, Walter Lines, Hilary Page and Ruth Handler are also included. This book combines Deborah’s long-term interest in the history of childhood and play with her knowledge of technology and manufacturing. The History of Toys can be purchased via Amazon, or by emailling Deborah. Playing it safe, but is it too safe? – Financial Times article about adventure playgrounds, quoting Deborah.